Unlike any other species, humans can learn and use language. 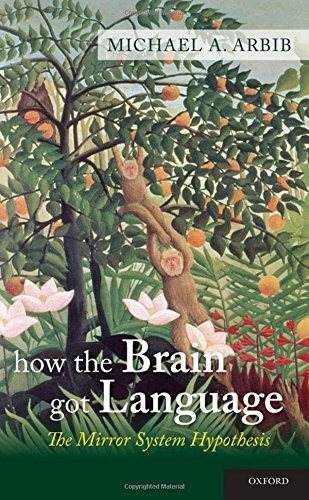 This book explains how the brain evolved to make language possible, through what Michael Arbib calls the Mirror System Hypothesis. Because of mirror neurons, monkeys, chimps, and humans can learn by imitation, but only "complex imitation," which humans exhibit, is powerful enough to support the breakthrough to language. This theory provides a path from the openness of manual gesture, which we share with nonhuman primates, through the complex imitation of manual skills, pantomime, protosign (communication based on conventionalized manual gestures), and finally to protospeech. The theory explains why we humans are as capable of learning sign languages as we are of learning to speak. This fascinating book shows how cultural evolution took over from biological evolution for the transition from protolanguage to fully fledged languages. The author explains how the brain mechanisms that made the original emergence of languages possible, perhaps 100,000 years ago, are still operative today in the way children acquire language, in the way that new sign languages have emerged in recent decades, and in the historical processes of language change on a time scale from decades to centuries. Though the subject is complex, this book is highly readable, providing all the necessary background in primatology, neuroscience, and linguistics to make the book accessible to a general audience. View More In Behavioral Sciences.